I sent him an email not 5 hours ago, and he promptly responded...and oh boy, this is a big one! of been built as it was originally intentioned. work backed up on my trustee old "JAZZ" drives jeje..
you and all at "TresCom"
He seems to remember very much about PV. We can see what he still remembers about it, if he has any new information/modes/images, and then open it up to the public for an interview. Oh man... that's great info! Finally, something pointing to there being a fench structure type thing between the Lab and PV levels. I wonder of the View building was a part of that post? Possibly... that also explains the green T-Rex and the lagoon, I guess. Last edited by machf on Fri Mar 23, 2007 11:43 pm, edited 1 time in total. Do you think we ought to see if he's interested in joining the forums, and giving him access to the PV member's-forum? He seems very interested and enthusiastic in seeing PV recreated. Yes, that would be awesome! I'd like to hear his crits on my View Building recreation, since he's the one that was in charge of PV. We could definitely use his help, sounds like he knows exactly how PV should look. Heheh this is amazing... though let's not get too big for our britches just yet. Do we know what his current occupation is? Not everyone has as much time as some of us, to wander around forums hours at a time.. of course if he CAN spend any desent amount of time here, that would be great. But let's take that slowly, don't want to make him feel like we want to drag him into a pit of quicksand, if you know what I mean. Let's first see how much more he remembers, and what things he has available for us to use. Any textures, and of course screenshots would be very helpful.. NOT TO MENTION any surviving models. Mickey I'm doubting any versions of the level survived... Of course if they did that would radically alter this entire project, making my files completely obsolete. I anxiously await finding out what he has on those JAZZ discs, we definately need to open a thread in the public PV section about questions for these two fine genetlemen... (we might as well bunch them into one, and either ask all the questions of each of them, or figure out a few which might only apply to one or the other of them). While this doesn't show the primary terrain object I have set up, it does seem to show the trench located there, and as you can see, the raptors are drinking from some sort of object in the middle, roughly where the circular "blemish" in the Mayan floor texture goes. Also next to it, can see a gray stone that looks remarkably like one of the fragments of the Mayan pillars. You later progressed on to a section deeper in the Valley, by a Raptor's den with some very aggressive Raptor's protecting the grounds of some abandoned Mayan ruins. This image would seem to show the raptors which protected these grounds; perhaps they protected it as a dependable source of good-tasting water. The only questionable part is the "den" aspect of the location, though I would say this didn't have to refer to an interior setting. Still, a question to raise with him. We could even provide a link to this image within the question.. (as well as a link to a pic of my partially reconstructed location). I believe Leovenis was the first to suggest this was for a "second harbor" in PV, which after some consideration I came to agree that PV is the only place this really would have fit, since the main harbor has much better facilities for this and its terrain looks much different. Anyways.. something else to ask about. Taking another look at it now, I think the wall/mountain lies behind the raptors...? roughly where the circular "blemish" in the Mayan floor texture goes. I positioned that texture a bit differently... I'll show you later. Also next to it, can see a gray stone that looks remarkably like one of the fragments of the Mayan pillars. That flat piece lying right next to the raptors' feet, right? Yup, that was my thougth when I read it. perhaps they protected it as a dependable source of good-tasting water. The only questionable part is the "den" aspect of the location, though I would say this didn't have to refer to an interior setting. Still, a question to raise with him. We could even provide a link to this image within the question.. (as well as a link to a pic of my partially reconstructed location). Heh first off I think we should mention in the next letter that in NO WAY can anything he says about PV be considered "rambling", we appreciate every word of it. As for this post.. good bet it's the View building. All we can tell about it is that it seems to be a storage facility, and went somewhere in Pine Valley. (The red "pump" is seen in another image as well, and we wonder what its purpose was.) One of the most difficult things about the image is the presence of the vertical trench. Both of the trenches found in the Demo terrain, besides the one surrounding the Geothermal Plant, look very natural, and don't seem to fit well with any flat-lined objects. It's also confusing because access is granted to it by a model we've identified as "SWreckedBridge-00", in addition to some pieces we don't have. We don't understand how this worked if the road going throughout the level is meant for cars, which it obviously is. The building must not go beside any roads, but that only makes it more difficult to place on the map. We wish to know anything you remember about this place! 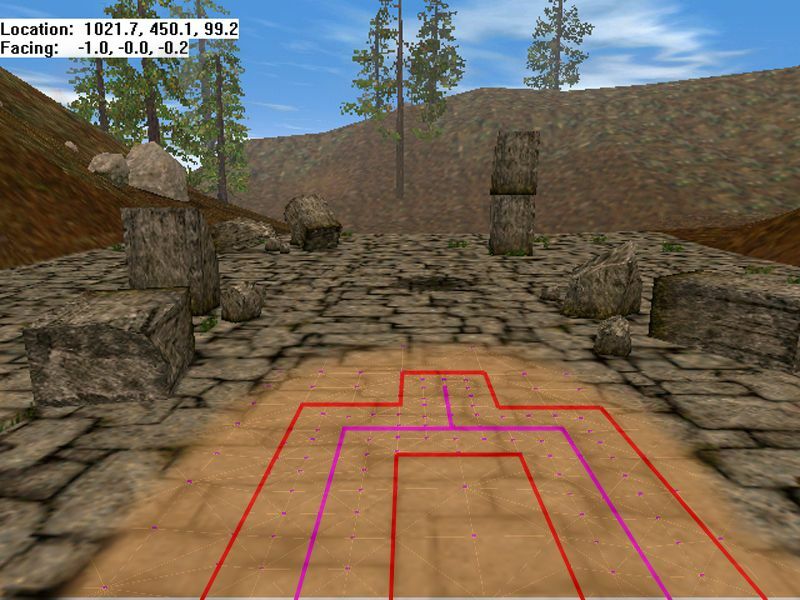 They depict a version of the Plant where one of the walls was actually at a different angle; we decided it differed so much from what the Demo terrain showed because it would have been impractical/impossible to edit the terrain to match the path that the surrounding trench would have to take, so it was straightened and aligned with the terrain. We would of course appreciate any insight to this location - in an interview with another Tres dev, we were given a rough idea of the tasks that had to be performed inside, including removing something from a fan and filling some area with water. We also know that two drawbridges granted access to the Plant - we have absolutely no idea what they looked like, if they resembled existing models or were totally different, or which drawbridge the player was supposed to enter through, or if it mattered. All we know is that both drawbridges start as raised, and that the front one can be lowered by shooting out a block of wood located somewhere on it. Any information you could provide on that would be very helpful! There is also a matter that has plagued many members of late - the trench. The terrain suggests that the trench has angled walls, which would have been detailed by concrete terrain objects, we assume. Many of us however suggest that separate models were used to make the walls of the trench perfectly vertical. We really don't know which it was, but the idea of vertical walls came from images of the "view" building, or abandoned post, which show concrete walls coming straight up. We also don't know exactly what this trench was for, except that it would have had water in it, only we don't know how all the water was kept from immediately draining into the ocean! Besides its shape, we'd also like to know anything you can tell us about its purpose, or for example if it had actual water objects in it. We would really like to know what this place was, why it was there, and what it was for. The images were originally named "LAGOON", though I don't see how it could be a lagoon if it was filled with tar. There is a location on the map with rather damaged-looking terrain, as well as evidense of the PV "sand" terrain objects, so this is where we suppose it goes, but we really don't know that either. Some seriously doubt it lasted very long into production. Any info on this area would be great! 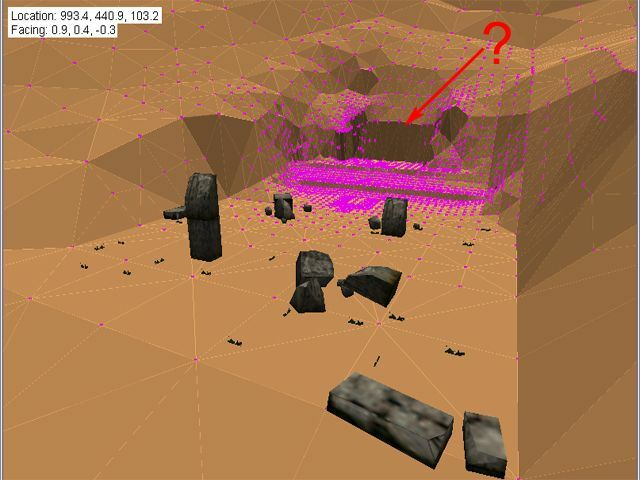 This is one of many things that give evidence to the Demo terrain being slightly inaccurate. While some such inaccuracies can be blamed for the scope of area intended for the player to be restricted to in the Demo, this location is somewhat distant from the helicopter pads. 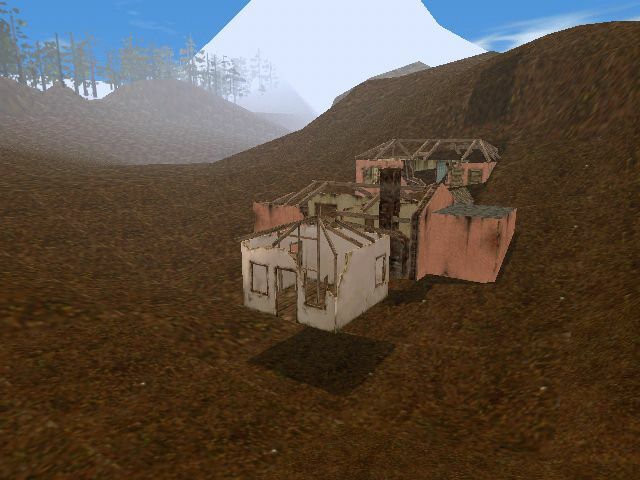 You may not be able to say much about this, but is there any reason you can think of that the terrain would not accommodate the Plantation House? 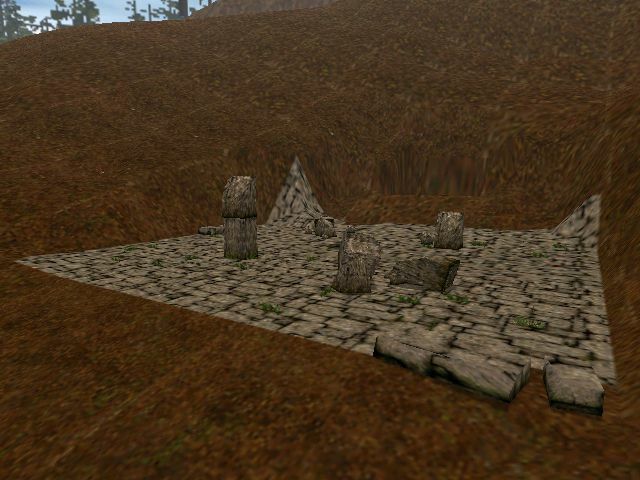 Is there anything else you can remember about it, such as what its surroundings looked like, or what sorts of objectives/dinosaurs were in the area? If you remember how this spot looked, we'd appreciate finding out. We'd like to know anything you can tell us about this, including what the canal was for and what all seems to be missing from our recreation. PS: Slugger I think you should note somewhere in the preliminary lines of the email that in NO WAY can anything he says about PV or Trespasser be considered "rambling", we appreciate every word of it. Also I'll leave final thanks in advance for answering the lengthy questions to your own conclusion of the email. Dirsregard the one on the top right corner, that's the earlier mockup building which I placed near the last ditch at first to see if it matched... in the current location, the roads match what can be noticed in those screenshots we have. Mr. Salas just joined the forums as "PS_Trespasser," just notification.